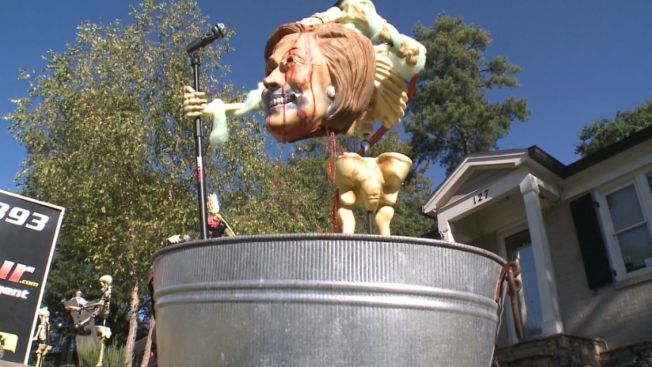 A gruesome Halloween display in front of a Marietta, Georgia business is upsetting neighbors. It depicts presidential candidate Hillary Clinton decapitated, in a pool of blood. Albin Blomkvest said he puts up Halloween decorations every year, and that it started it as a way to draw attention to his business. Still, he knew it would be controversial this year. "I put the Trump dummy out first and somebody stole it, so that was the key that I had to put the Hillary head out," he said. "Everyone thinks it's funny," he said. But Hillary Clinton supporter Adrienne White doesn't think it's a joke. "There's absolutely no taste in portraying a presidential candidate in this manner," White said. Read more on this story at 11Alive.com.